To answer this question, you’ll engage in this primitive exercise of cramming into a meeting that literally no one in the room wants to be at–the reporting meeting. And afterward? Yeah, nothing much will change. Everyone will mostly put their heads back down and resume work on whatever they were working on before this exercise. But hey, let’s do this again next month, am I right? They’re stale. Reactive. Unproductive. They require a ton of time and resources to put on. Reporting meetings once served a purpose–to report on the data in aggregate from campaigns that were otherwise hard to measure in real time. But now? In a time where I can see how an ad campaign is performing, right now, and make adjustments, right now, to influence performance? Well, they’re relics of another era. One where we all couldn’t track and influence campaigns right now. This has changed everyone’s expectations for how we should work, including everyone attending this aforementioned reporting meeting. You? Well, it’s not uncommon for you to refresh the performance dashboard of a tool (multiple times, amirite?) in order to see the latest update. Your bosses? They ask you how that latest campaign is performing, or why upgrades are down this month. Your clients? Well, they parachute in with urgent suggestions mid-month all the time, right? So, everyone in the reporting meeting has expectations of monitoring and adjusting campaigns as they happen, yet we’re all relying on this relic of a meeting as a conduit for action? Here’s more on why reporting meetings are awful and what we can all do about it. Can you imagine a coach waiting until the end of a game to provide feedback to her players? Instead, she’s constantly reading the defense and communicating adjustments from the sidelines or during breaks in the game. Reporting meetings are not designed this way. Instead, they set a cadence across your whole team of analyzing and improving performance on a monthly basis rather than instill a culture of continuous learning and improvement. This matters. As when you’re meeting with your boss, team, or clients, you’ll either be looking back (why did these things happen?) or looking forward (how can we make these things happen?) instead of maintaining focus over what you can control right now. And, even though reporting meetings are standard practice in most companies, everyone in those companies has on-demand expectations. Why are sales down? How is our spring email promotion performing? Should we invest more in our Facebook campaign? No one wants to wait until the end of the month for these answers, but in a world where most teams still rely on static tools like spreadsheets and slides, it’s just what happens. So, how can we enable our team to make adjustments throughout the month to positively influence performance? By killing reporting meetings altogether. Think about it––the word “report” itself suggests finality. Students turn in reports when they’re completed. Investigators issue reports upon the completion of an investigation. Scholars publish reports once they’ve completed their research. But, performance is never complete. Performance is fluid and can and should be monitored and adjusted as things happen. In the old way of reporting, performance improvement was linear. The work happened, followed by the analysis by a select few people within the company at the end of the month (or worse) quarter. So, what if you ended reporting as a habit at work? Often times, the data presented in reporting meetings are accessible to a select few–executives and/or members of the leadership team. Individual contributors, the ones with a desperate need to see how their work is influencing the bigger picture, are often left out of these meetings altogether, or, they’re left with spreadsheets and/or slide decks to comb through in order to find relevant information. 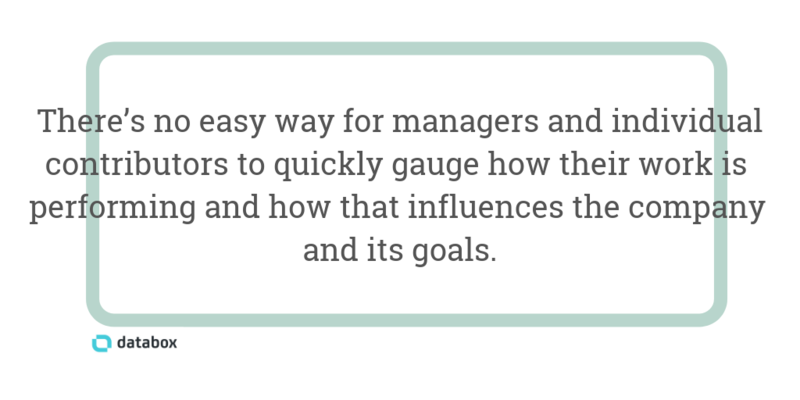 Aside from logging into the actual tools themselves, there’s no easy way for managers and individual contributors to quickly gauge how their work is performing and how that influences the company and its goals. Consequently, the vast majority of people doing the work within your company aren’t sure how to improve the work they’re doing. You can spin data any way you’d like. This is a common refrain against marketers that rely on data in order to make decisions. And you know what? It’s accurate. But, when the data is accessible to everyone, so too are everyone’s insights and points-of-view. 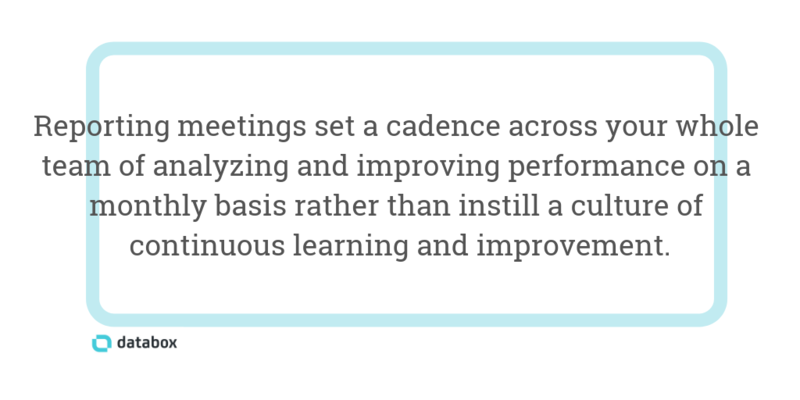 Most reporting meetings are not spent analyzing trends and making timely adjustments. 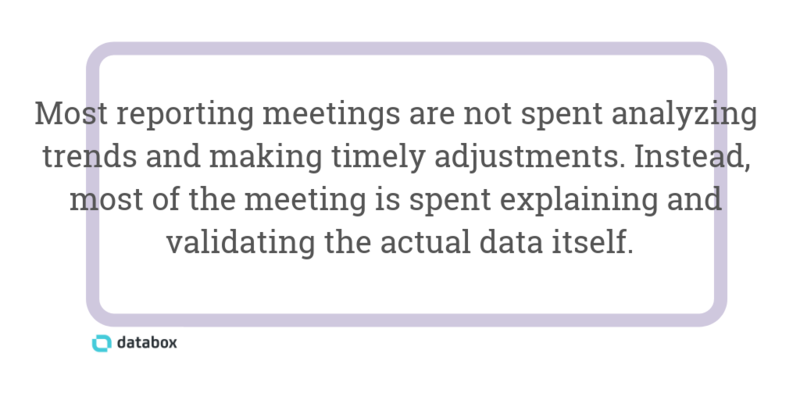 No, most of the meeting is spent explaining and validating the actual data itself. But, how can a manual process that includes pulling data from dozens of sources, manually copying that data into spreadsheets, and finally, visualizing that data in a slide deck, ever be free of error, and as a result, gain the level of trust necessary for having productive conversations? Align all of your data in one place. Stop relying on the manual excavation in order to provide everyone with the insights they need to do great work. Make that data accessible to everyone in real time. Familiarity breeds trust, but it also allows everyone to provide valuable context as to why things are happening. For people to trust the data, everyone needs a voice. “The data itself shouldn’t be a surprise to anyone in the meeting,” said Remington Begg, founder of Impulse Creative. As I mentioned earlier, monthly reporting sets a cadence throughout the whole company of only measuring performance once a month. This negatively impacts the whole team, as they’re not developing the habit and skill of proactively connecting the dots between the work and the results. Instead, these bloated, high-level reports are shared at the end of the month when, once again, it’s already too late for your team to double down on something that’s working. If they’re not trained to be looking for these things as they happen, your team is far less likely to have the ability to make adjustments that create an impact when it matters most––right now. By being more proactive and giving your team the tools they need to better understand the significance of different activities, you’ll be able to build a more data-driven and autonomous team. If not reporting, then what? Reporting meetings serve a purpose that no longer really exists–one where performance data wasn’t available in real time. So, how can you act on the right data when it matters most? How can you make that data more accessible to your team in order to empower great work? How can you meet the real-time expectations of your team, bosses, and/or clients? Today, we have access to more data than ever before, but we still don’t know how to use it. In order to compensate, most companies have a monthly reporting meeting that no one wants to attend and where nothing changes. Align: Make the data accessible to everyone on your team by bringing it together in one place and aligning everyone on the right goals and KPIs to track progress toward them. Analyze: As we discussed earlier, performance data is available (and thanks to step 1, now it’s accessible) to everyone in real time. That’s also when analysis, context, and correlation should be shared with others. Adjust: No more waiting until the end of the month or quarter to understand performance and make adjustments. When your team has access to, and is analyzing, performance data as things happen, you can make adjustments when they matter most–right now. We’ll be publishing more on this framework very soon, but for now, watch as my colleague Tory Sher outlines effective ways for ditching reactive reporting. Ready to join us on our mission of making performance data more actionable and accessible for everyone? You can create your free Databox account here.